at Cook County Animal and Rabies Control are providing rabies vaccinations at sites across the county, now through October. Clinic hours are 10 a.m. to 2:45 p.m.
Rabies shots for dogs and cats will cost $7 for a one-year dose and $21 for a three-year dose. 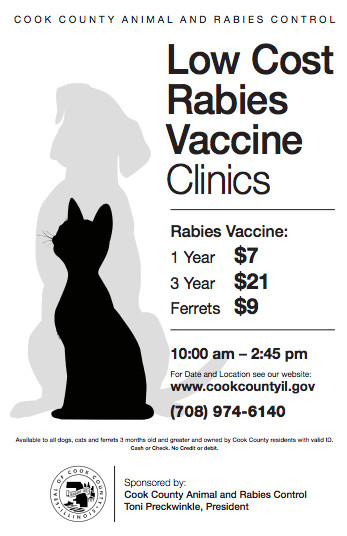 Ferrets may only be vaccinated for one year, and the cost of the shot is $9. Microchip services will not be offered at the rabies shot sites. Please read the clinic rules after the dates below. Tuesday, June 16: Marquette Park, 6734 S. Kedzie. Wednesday, June 17: Our Lady of Loretto Church, 8925 S. Kostner, Hometown. Tuesday, July 21: Brookfield Village Hall, 8820 W. Brookfield. Tuesday, August 4: Douglas Park 1401 S. Sacramento. Tuesday, August 25: Piotrowski Park, 4247 W. 31st Street. Wednesday, August 26: Sterling Estates, 9300 W. 79th Street, Justice. Wednesday, September 9: VFW Hall 1529 S. Harlem, Berwyn. Wednesday, September 16: Jewel-Osco,128th and Harlem, Palos Heights. Tuesday, September 22: Animal Krackers, 3309 W. 115th Street, Merrionette Park. Wednesday, September 23: Harrison Park, 1824 S. Wood. Tuesday, October 13: McCook Athletic & Exposition (The Max) 4750 S. Vernon, McCook. · No retractable leashes will be allowed. All dogs must be on leashes of no longer than six feet long. · Maintain a distance of three feet between each animal. · Owners must provide own muzzles if required. · No animal socialization will be allowed. · No petting of animals other than your own. · Dogs showing signs of any respiratory disease will be isolated for vaccination. They will be prohibited from standing in line. · Families with multiple animals should bring enough capable family members to have one individual securing the paperwork while another individual presents the animals for vaccines one at a time at the area designated by the veterinarian. · Handling of animals must be self-sufficient by a competent adult greater than 18 years of age. County Animal Control personnel will not be allowed to handle leashes, hold or move cages, assist in handling animals restraint or touch animals or animal equipment of any kind. · Water for pets must be supplied by owner. · Waste removal bags must be provided by the owners.